I love korker bows, I think they are SO cute, especially in tiny toddler pigtails. Lucky for me, they are also REALLY easy to make. 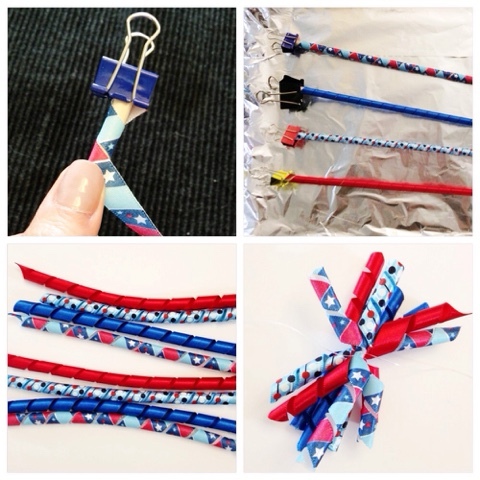 You can make korker bows out of almost any ribbon you want. (I have never bought a kind that doesn’t work) I love this since they usually have dollar bins full of ribbons at craft stores, especially around the holidays, so you can customize your bow to fit your exact needs. This weekend I made pigtail korkers, so they are on the smaller size. However, you can make your korker bow as large & as full as you would like, using this basic technique. 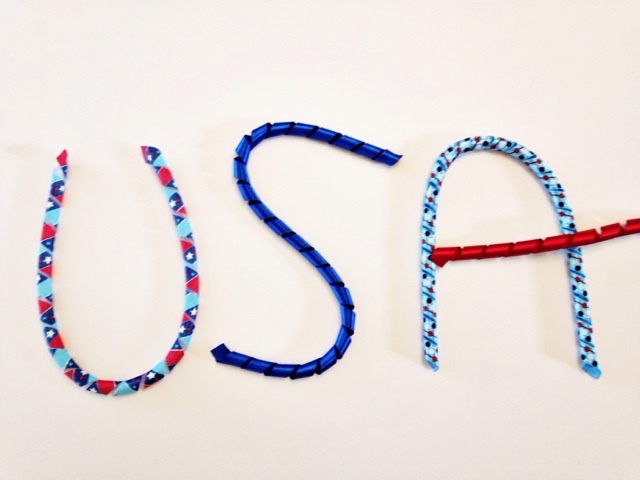 The ribbon I used is a 4th of July 4 pack that was a dollar at JoAnn’s fabric. I decided to use clips I already had since they already had cute little stars on them. So cute, right? Besides the cooking and cooling time these take like 10 minutes TOPS to make. If you end up making your own tag me on Instagram… I would love to see what you come up with! My little cutie is ready for the 4th of July! This is too cute! 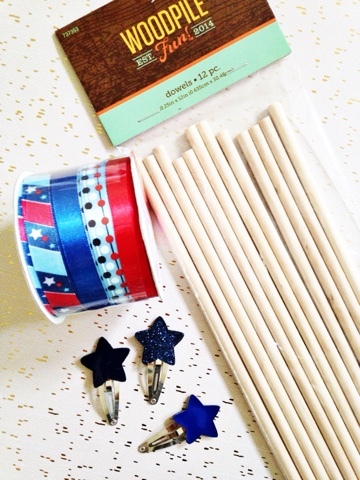 What a fun idea for 4th of July! She looks adorable!!! Thank you! She was actually in a cooperative mood.. she must have really liked them! These are so cute! I was just thinking last night it's been ages since I put Eve in pigtails — probably because her hair become so ridiculously (and adorably) curly I haven't wanted to brush it out. But I would love to make these to put in her hair! She requests them.. "mommy I want 2 ponytails!" haha at least she lets me put her hair back, it used to be a battle! Oh my goodness, these are adorable! I need a little girl so I can make these!!! Girl stuff is pretty fun.. coming from a total non-girly girl… I surprise myself since having a daughter! ha! She's a cutie! Love the bows, very pretty, and great for the 4th of July. cute! they look like firecrackers! OMG! Seriously!! So adorable-love these! BRILLIANT! Totally making these and sharing! Totally good for women's soccer final Sunday too!! Omg so cute! I'm not going to lie, I probably won't make one, I so don't get crafty like that very often. BUT, I'd totally buy one from you! I love! Wow, those are so adorable…and they look so easy (and festive). Love it! She is such a cutie. I used to hate things in my hair growing up! Have a great 4th of July. These are just so adorable and you have the cutest model! Im excited I'll get to start making little bows like this for my new baby girl. So cute! 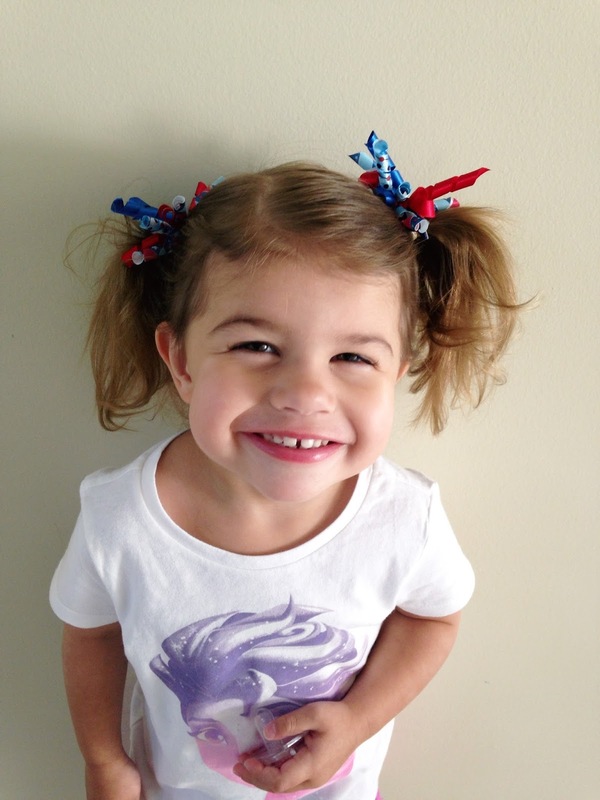 Your daughter is adorable, and I love the bows…and pigtails! This is fantastic! I always buy them from Gymboree and now I can make them myself. Thanks, Lauren! Oh I am gonna try to make these this weekend and have my 9 yr old girlie make hers while I make my 3 yr old’s they will love this! How cute! My little one just started wearing pigtails so I may have to get crafty! These bows are too cute and so is your model!!! Oh my goodness, these are adorable! I need to make these for my daughter this summer. Thanks for the instructions! Ooohhhhh my GOODNESS!!! Could she be any cuter?! The bows are adorable too….my girls would love them! !